The Czech Museum of Music has granted a loan to the Victoria and Albert Museum of one of the TOP items of the National Museum in Prague – Mozart’s fortepiano from the 18th century. Last week it was transported in a special, tailor-made box, under very strict safety measures, to London. The precious instrument, which can usually be seen in the permanent exhibition of the National Museum, Man – Instrument – Music, will be on show in the London museum in the exhibition “Opera: Passion, Power and Politics”, from 30 September 2017 to 25 February 2018. The exhibition in the largest museum of art and design in the world presents the story of the opera, from its beginnings in late-Renaissance in Italy to the present. Besides Mozart’s piano, opera costumes, prints, caricatures, etchings, paintings, scores and other items will be exhibited. With seven premiers in seven European cities, the exhibition will take visitors on an almost 400-year-long journey culminating in the international boom of the 20th and 21st centuries. The visitors will first be transported to carnival in Venice, Italy (1642-1643); here, the term "opera" was used for the first time. Further steps will lead to England, where in 1711 Handel’s first London opera, Rinaldo, was premiered. The following part represents the premier of Mozart’s Marriage of Figaro on 1 May 1786. In this part of the exhibition is the fortepiano, made in 1785 by the Viennese master Franz Xaver Christoph, which W. A. Mozart played during his visit to Prague in January 1787. After that, the exhibition conveys the visitors to Milan, Italy, and the premier of Nabucco by G. Verdi, which occurred on 8 February 1842. The subsequent parts of the exhibition introduce the Paris premier of R. Wagner’s Tannhäuser (3 May 1861), the premier of Strauss’s opera Salome in Dresden (9 December 1905) and the premier of Shostakovich’s Lady Macbeth of Mtsensk in St. Petersburg, Russia (24 February 1934). a plaque placed on the piano in later years; however, it does not correspond with historical sources. The plaque says that Mozart played melodies from Don Juan during his visit, while he actually composed this opera somewhat later. Unfortunately, we do not know on what occasion or when the plaque was placed on the piano. 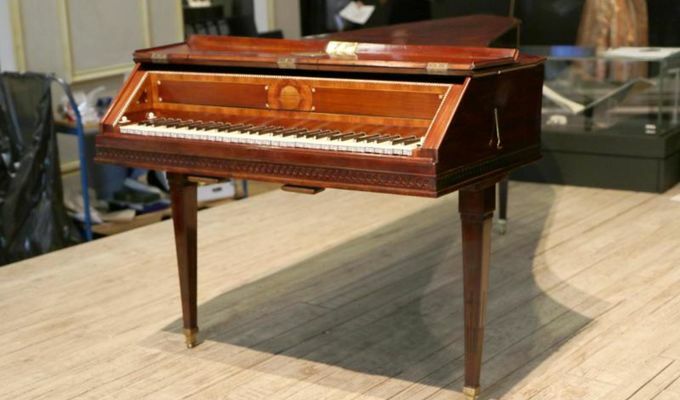 The piano was made in 1785, but bears no sign of its maker. Most likely, it is the work of the Viennese master Franz Xaver Christoph (1728-1793). As there are only three extant instruments by F. X. Christoph known, this is a very rare specimen. The piano has an all-wood construction, being made of mahogany; the keys are inlaid with mother-of-pearl, and it has a hammer mechanism and two knee levers (which have a similar function to pedals). The resonance plate is decorated with a rosette. The instrument displays excellent craftsmanship. We apologize to museum visitors; being on loan for an exhibition at the Victoria and Albert Museum in London until the end of March 2018, Mozart's piano will not be on show in the permanent exhibition. It will be replaced temporarily by a photograph of the piano and the oldest stringed instrument from the National Museum collections - the pentagonal virginal from 1572.